Acupuncture is the practice of inserting needles into specific points along the body’s meridian system to treat disease, relieve pain, and balance the flow of Qi, or energy, in the body. Acupuncture originated in China 5,000 years ago, and it is has been adopted in Western Medicine as a popular alternative treatment. To practice acupuncture, a person has to enter training, become certified, and maintain continuing medical education credits to retain licensure. According to traditional Chinese theory, health is defined as a state of balance in the body maintained by the flow of Qi along meridians, or pathways, in the body. Qi, inherited at birth, regulates spiritual, emotional, mental, and physical balance and is influenced by yin and yang. A disease state occurs when there is a blockage in the flow of Qi. Acupuncture is based on the belief that there are 360 specific points along the 14 different meridians that course throughout the body. After a detailed medical history, and a careful exploration of a patient’s personality, the acupuncturist determines where on the body the needles should be placed to restore normal function of the meridians. The body is thereby enabled to relieve what is congested, and supply what is deficient, thus achieving a balance between yin and yang. Acupuncture is thought to have an inhibitory effect on a hyperfunctioning organ, and to stimulate a hypofunctioning organ. There are many types of acupuncture, namely classical, computer-controlled, French, Japanense, Korean, Laser, and electro-acupunctures. 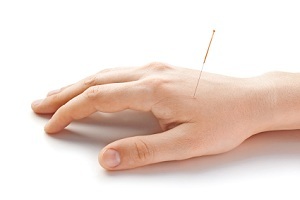 Medical acupuncture is a specialty practiced by a medical doctor that is trained in Western medicine. This physician can be of any specialty, and would have received limited training and certification in acupuncture, and performs it, most often for pain relief. There has been clinical evidence that acupuncture is effective in calming persons involved in dental or endoscopic procedures. It also has been used to treat fibromyalgia, nausea from chemotherapy, osteoarthritis, back strain from pregnancy, and post operative nausea and vomiting. Its use for IBS has been uncertain, based on the lack of randomized controlled trials that show the benefits of acupuncture. Although individuals have reported decreases in symptoms, more medical trials are needed to determine its effects on IBS. Natural Standard Research Collaboration. Acupuncture. [web page] www.naturalstandard.com. Accessed June 26, 2008.